The kitchen has always been the heart of the home, but modern kitchens are also the centre for the home’s technology. The concept of a ‘smart kitchen’ has grown extremely popular over the past few years and has given rise to an increase in the amount of technology which has been specifically designed to suit the kitchen. In response, families are spending more time in their kitchens, marking a return to the concept of the kitchen being a ‘social’ space. Incorporating modern technology into your kitchen doesn’t mean you’ll have to do away you’re your Viners cutlery set, mixing bowls or other traditional elements. Today’s kitchen technology is about making the kitchen experience easier and more inclusive, whilst also promoting the concept of a kitchen as an interactive space. The most popular kitchen technology items therefore tend to be things like modular cooktops, task stations and state-of-the-art ovens and refrigerators. Common incentives for people to seek out modern technology for their kitchens is to make certain tasks easier. For example, a state-of-the-art oven might have improved ventilation and a modern refrigerator might have a digital readout on the front which informs you exactly what the temperature is inside. Because people are now spending more time in their kitchens, there’s now an extra incentive for social technology to be included in kitchen designs. These can include anything from integrated music technology, such as an iPod docking station and speakers, to a flat monitor screen which has been built into a counter top or wall unit. In addition to making the kitchen more fun to be in – thereby transforming it into a social space – we now have the technology to be able to make the kitchen more communicative with the rest of the house and, indeed, the world outside. Telecoms systems allow people in the kitchen to talk directly to people in other parts of the home, and a flat monitor would allow you to Skype with friends while you cook. Kitchen technology doesn’t just have to be about high-tech gadgets and communication devices. 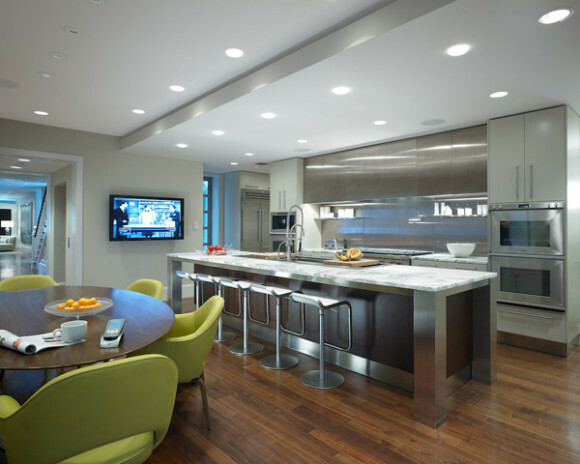 Some of the most technology to be found in the kitchen can actually be found in the materials used to make things like countertops, floors and utensils. From engineered quartz counters to heat reactive saucepans, many common kitchen elements have been modernised without us even realising.